Sub: School Education - Certain Instructions for conducting Half-a-day Schools during the month of March & April 2019 - Instructions - Issued. In view of the Instructions issued by the Govt. 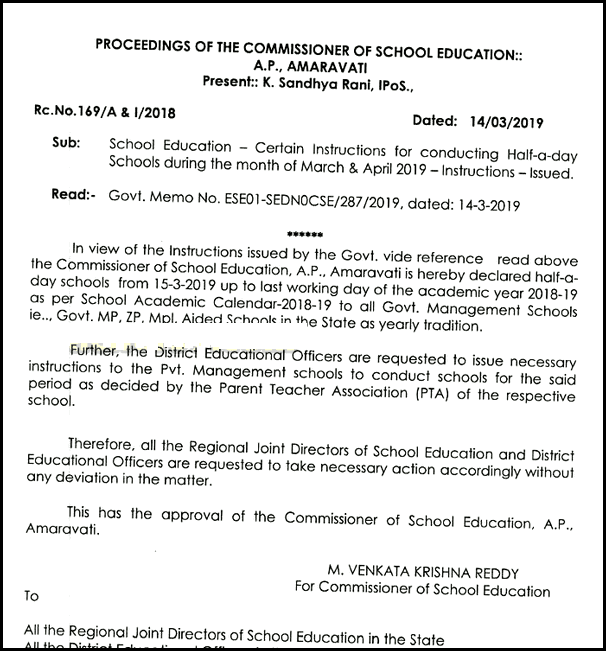 vide reference read above the Commissioner of School Education, A.P.. Amaravati is hereby declared half-a-day schools from 15-3-2019 up to lost working day of the academic year 2018-19 as per School Academic Calendar-2018-19 to all Govt. Management Schools ie... Govt. MP, ZP, Muncipal, Aided in ihe State as yearly tradition. Therefore, all the Regional Joint Directors of School Education and District Educational Officers are requested to toke necessary action accordingly without any deviation in the matter. This has the approval of the Commissioner of School Education, A.P.. Amaravati. Tags: AP Half Day Schools Start from 15-03-2019 Copy Download : Half Day School MDM Timings Copy Download: AP Half day Schools start 12th March 2018 Morning Schools time table, ap half day schools timing, Summer half day schools in ap and MDM Timings.